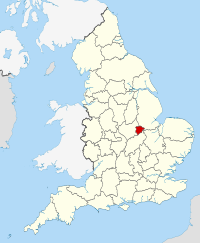 Rutland (/[unsupported input]ˈrʌtlənd/) is a landlocked coonty in central Ingland, bundit on the wast an north bi Leicestershire, northeast bi Lincolnshire an sootheast bi Peterborough (a unitary authority ceremonially in Cambridgeshire) an Northamptonshire. Its greatest length north tae sooth is anerlie 18 miles (29.0 km), greatest breadth east tae wast, 17 miles (27.4 km). It is the smawest (in terms o population) normal unitary authority in mainland Ingland (anerlie the Ceety o Lunnon is smawer in terms o aurie), an is 348t o the 354 destricts in terms o population. It is the smawest historic Inglis coonty, leadin tae the adoption o the Laitin motto Multum In Parvo or "Hintle in little" bi the coonty cooncil in 1950. Amang modren ceremonial coonties the Isle o Wight, Ceety o London an Ceety o Bristol are aw smawer. The umwhile Coonty o Lunnon, in existence 1889 tae 1965, an aa haed a smawer aurie. The anerlie touns in Rutland are Oakham, the coonty toun, an Uppingham. At the centre o the coonty is the large airtificial reservoir, Rutland Water, wi a similar surface aurie tae Windermere. It is an important natur reserve servin as an owerwinterin steid for wildfowl an a breedin steid for ospreys. The toun o Stamford is juist ower the border in a protrudin pairt o Lincolnshire. Rutland's aulder cottages are built frae limestane or ironstane an mony hae ruifs o Collyweston stane slate or thatch. This page wis last eeditit on 6 Februar 2018, at 20:22.